The clubs 'Golf Management' application, called Club V1. includes the feature to top up your Membership Card 'purses' online, using a credit or debit card. This is a very simple and secure process, and utilises the world renowned and highly secure, online payment system, Sage Pay. This new facility is called HowDoiPay. No more delays at the counter or bar while you top up before a purchase. 2. 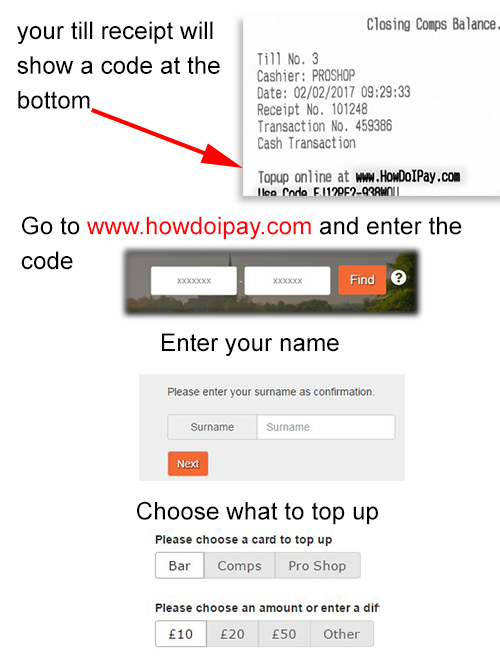 Alternatively you can Top-up online by going directly to the 'HowDoiPay web site. Each till receipt will has a unique code printed at the bottom. Go to www.howdoipay.com, the screen will display two boxes to enter the two part code into. You will receive an email confirming the transaction. Annual Bills will have a HowDoiPay code, you will follow the same procedure to pay online. More details on bill payment will come with your annual bill.